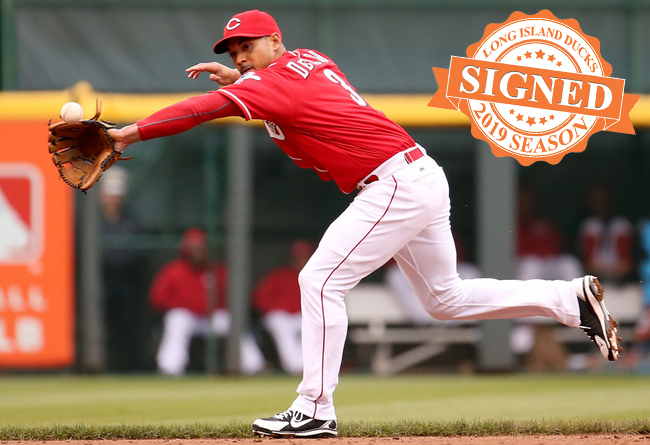 (Central Islip, N.Y., March 14, 2019) – The Long Island Ducks today announced the signing of infielder Ivan De Jesus Jr. The four-year Major League veteran begins his first season with Long Island and 15th in professional baseball. De Jesus Jr. spent time at the game’s highest level with the Los Angeles Dodgers (2011-12), Boston Red Sox (2012) and Cincinnati Reds (2015-16). In 228 MLB games, he totaled a .242 batting average, five home runs, 53 RBIs, 43 runs scored, 120 hits, 23 doubles and two triples. His first Major League homer came off Phillies pitcher Cole Hamels at Great American Ball Park on June 8, 2015. The Puerto Rico native played all four positions on the infield and spent time in left field as well, recording a .977 career fielding percentage. The 31-year-old spent the 2018 season with the Triple-A Pawtucket Red Sox of the International League. He compiled a .261 batting average, four homers, 31 RBIs, 33 runs, 16 doubles and a .962 fielding percentage in 97 games played. The son of former Major Leaguer Ivan De Jesus has earned three MiLB.com Organization All-Star selections, claiming the honor with the Dodgers (2010), Pirates (2013) and Brewers (2017). De Jesus Jr. was selected to play in the 2008 Futures Game, held at Yankee Stadium during MLB’s All-Star Game festivities. Additionally, he earned International League Mid-Season All-Star honors in 2014 with the Triple-A Norfolk Tides. De Jesus Jr. was originally selected by the Dodgers in the second round of the 2005 amateur draft.